Because of the game scale, 1 km hexes and 2 hour turns, most combat in the Modern Campaign Series is done from very close range. In fact, the majority of combat units in the game have a fire range of 1 hex and so they can only engage units in adjacent hexes. However, certain Artillery units are able to perform Indirect Fire. In this case, another unit in the firing unit’s controlling organization is used to spot the target unit. Units capable of Indirect Fire are identified as such in the unit window, seen by long pressing on the unit picture in the Hex Info Area. In addition, Indirect Fire units are listed in the Artillery Dialog, seen when you press the Artillery Dialog button. 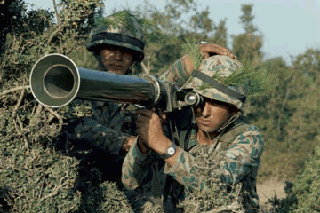 Other combat units (non-Indirect Fire) must be able to see the target in order to engage it. Seeing the target is based on the combined effect of Line-of-Sight and Visibility range. Basically, units cannot see through towns, woods or over hills, nor see beyond the maximum visibility for the environmental conditions. Fire against a target unit is resolved using the Combat Results calculation. The combat value used is the modified attack value of the firing unit divided by the modified defense value of the target unit. The following describes the modifiers and restrictions that apply to this calculation. When a unit performs Indirect Fire, the target hex must be in the Line-of-Sight of a valid spotting unit from that side. Broken units (see Morale) cannot perform spotting for Indirect Fire. Detached units (see Command) can spot for Indirect Fire, but if only Detached units can see the target hex, the fire is half value. To fire a unit, the game must be in Fire Mode. One way of doing this is by pressing the Mode button at the left side of the toolbar. To return to Move Mode, press the button again. Alternative if you long press in a hex containing your units and lift your finger, it will toggle Fire Mode. Using either method you tap on the target hex to fire. Pressing the Artillery Dialog button on the toolbar is another method used for firing artillery. For most units, the cost of firing is 1/3 of the unit’s Movement Allowance. For units firing using Indirect Fire, the cost is 1/2 of the unit’s Movement Allowance. Ships pay twice the normal firing cost, but their fire value is doubled when firing. Indirect Fire can sometimes create Rubble in the target hex depending on the fire value of the firing unit and Parameter Data. Lost Strength - in Vehicles, Guns, or Men. Increase in Fatigue – depending on the fire effect. Disruption - if the fire result affects the target unit, then the target unit performs a Morale Check based on the amount of the effect. If it fails the Morale Check, it will become Disrupted. If it is already Disrupted, fails the Morale Check, and is at Maximum Fatigue, then it becomes Broken. A unit that is Disrupted represents a unit has been made less combat effective because it has been exposed to very heavy fire. This represents the fact that control of the formation has been reduced, thus reducing fire effect of the unit as a whole. The men are still firing but more at the target of their choice. If the unit is composed of tanks, then many of the crew commanders have "buttoned up". Disrupted units have 1/2 fire value. If a Disrupted unit fails a further morale check, it becomes Broken. A Broken unit has suffered even greater effects than Disruption. Such a unit cannot attack. This represents that the sub units that make up the Broken unit are under the direction of lower level section and platoon commanders. The unit is severely pinned but has not lost the will to fight, only the ability for organized offensive action. A Broken unit can still defend but will also yield more prisoners if assaulted. Larger Broken units can often take several game turns to completely eliminate. Broken units that are not at Maximum Fatigue can recover "on their own", but if they have no HQ, or if their HQ has failed the Command Test, then the probability is halved. A Broken unit has no Zone-of-Control. A Broken unit will take fewer casualties from enemy fire because it is considered not to be exposing itself as it would normally. Recovery from Disrupted or Broken unit status is discussed under Command in the section on Disruption Recovery. Combat results are reported on the map as a message over the target hex. The message describes the number of men, vehicles, or guns lost by the fire or assault combat. In some instances, the result has a coded suffix and is color-coded to describe more detail as described below. When the result is shown in yellow and is followed by the "/D" suffix, it means the target unit has been Disrupted. When the result is shown in red and is followed by the "/B" suffix, it means the target unit has been Broken. When the result is followed by the "/X" suffix, it means the target unit has been Eliminated. Target class - Depending on whether the target unit is a Hard Target or not, the Hard or Soft Attack value of the firing unit is used. Long Press on the Unit Picture in the Hex Info Area to see the Hard and Soft Fire factors. Some units may not be able to engage Hard targets such as tanks or Pillboxes at a range of even 1 hex. The attack value is multiplied by the strength in vehicles or guns of the firing unit, (if the unit’s strength consists of men its strength is divided by 10, equalizing 1 Vehicle or Gun = 10 men). Hexsides - if direct fire from the enemy unit passes through a hexside of the target hex, then the target unit benefits from the hexside modifier of that hexside (see the Parameter Data for these values). Base Terrain - a target unit that is Deployed benefits from the terrain modifier of the terrain in the target hex. Bunkers and Pillboxes - non-vehicle units (and Deployed Motorized or Mechanized Infantry) that are Deployed benefit from Bunkers and Pillboxes in the target hex. There is a Quality Fire Modifier Parameter Data value, which is by default equal to one, that applies to fire modifiers for A and B units below. If the Quality of the firing unit is A, then +20% times the Quality Fire Modifier value applies. If the Quality of the firing unit is B, then +10% times the Quality Fire Modifier value applies. If the Quality of the firing unit is C, then no firing modifier applies. If the Quality of the firing unit is D, then a –20% modifier applies. If the Quality of the firing unit is E, then a –40% modifier applies. If the Quality of the firing unit is F, then a –60% modifier applies. Unless the fire is Indirect, if the target unit is at a higher elevation than the firing unit, then the elevation modifier Parameter Data value applies. If the firing unit has Medium Fatigue, then a –10% modifier applies. If the firing unit has High Fatigue, then a –20% modifier applies. If the firing unit has Maximum Fatigue, then a –40% modifier applies. Disrupted units have 1/2 fire value. Broken units cannot fire but they can defend themselves. Units that are Digging-In or Low on Ammo have 1/2 fire value. Normally, units in Travel Mode have 1/2 fire value. However, if the unit is firing from a hex it cannot enter except using Road Movement, then the fire is 1/4 value. Examples of this include tanks in Travel Mode in Swamp hexes and artillery deployed along a road in a Swamp hex. Units in Rail Mode cannot fire. Direct fire at ranges greater than 1 is modified by the Range Effect Parameter Data Value. For example, if the Range Effect value is 1/3, then the fire value of direct fire at a range of 2 hexes is multiplied by 1/3. Indirect fire against a hex not spotted by a friendly unit has 1/4 fire value (this only applies under the Indirect Fire by the Map Optional Rule). Target units in Travel or Rail Mode, other than Towed-Guns, have 1/2 defense value. Towed-Guns in Travel or Rail Mode have 1/4 defense value. Target units in Travel or Rail Mode do not benefit from any terrain effect. When the target is hard and the firing unit is artillery or heavy artillery firing at a range of 1, then the fire value is multiplied by the Artillery Hard Target Mod Parameter Data value. A modifier applies when a unit fires Indirect Fire under opportunity fire (i.e., fire during the opposing turn). This modifier depends on the side of the firing unit and its value is determined by the Indirect Mod Parameter Data values. For example, if the Allied Indirect Mod value is 50%, then whenever a Russian artillery unit fires Indirect Fire during the Axis turn (or during the Defensive Fire Phase), the fire value of that unit is only 50% of its normal value. Indirect Fire during the unit’s turn (or during the Offensive Fire Phase) is not affected. If the Indirect Mod value for a side is 100%, then there is no change to the fire value. Infantry units have an effective strength that is used when firing that is different from their actual strength. The justification is that when infantry units take casualties, the remaining infantrymen will use the heavy weapons in the unit compensating for the loss in men. Parameter Data determines the "breakpoint" used in this calculation. For example, suppose that Infantry Effectiveness was given as 70% men equals 90% effectiveness. Then for Infantry units between 70% and 100% in strength, effectiveness is calculated between 90% and 100% using linear interpolation. Likewise, for Infantry units between 0% and 70% in strength, effectiveness is calculated between 0% and 90% using linear interpolation. In general, this will result in higher fire effectiveness associated with the Infantry unit. Due to the nature of Armored Warfare, when anti-tank guns of different calibers direct fire against armored targets of different strength, special consideration has been given to the game’s combat results. When direct fire occurs against an armored target, these penetration considerations are applied to the target in what is termed a non-linear effect. This non-linear effect is described further below. There are two cases for this Armored Effectiveness special rule, each with a different calculation of the fire modifier. Case 1 is where the Firing Unit’s hard attack value is smaller than the defense of the target. This is the Small Gun vs. Strong Target case. Case 2 is where the Firing Unit’s hard attack value is larger than the defense of the target, or in simplified terms represents a Big Gun vs. Weak Target. The fire modifier for the two cases are shown below where the hard attack value is H and an armored unit defense value is D.
Case 1. If H < D, then the modifier is H / D.
Case 2. If H > D, then the modifier is 1 / Square Root (H / D). For example, suppose a unit with a hard attack value of 4 fires on an armored unit with a defense value of 8. Then an armor effectiveness modifier of 1/2 is applied to the fire value. Also, if a unit with a hard attack value of 8 fires on an armored unit with a defense value of 2, then an armor effectiveness modifier of 1/SquareRoot(4) = 1/2 is applied to the fire value. In the first example, the modifier represents the effect of non-penetration by the firing unit. In the second example, the modifier represents the fact that once penetration is achieved, then fire values do not increase linearly. That is to say, if you are firing a large caliber anti-tank gun at a weaker target and you get a hit then you don’t get two kills. This would be like a big AT gun killing two halftracks with a single shot. Fortifications consist of Improved Positions, Trenches, Bunkers, and Pillboxes. Each of these has an effect on fire against units given in terms of a percentage modifier. These values are found in the Parameter Data and are also shown in the Terrain Information Box of the Hex Info Area. Improved Positions and Trenches benefit all types of units and do so only with the previously mentioned modifier but do not provide any added Defense value. Bunkers and Pillboxes provide an increase in the Defense value as well as the fire percentage modifier. Furthermore, units in Bunkers and Pillboxes are considered Hard Targets and thus are only affected by the Hard Attack value of the firing units. In order to receive the benefits of a Bunker or Pillbox, a unit must not consist of Vehicles (however Deployed motorized/mechanized infantry do benefit) and the unit must be Deployed. When the defenders lose an assault, but are unable to retreat. Full-strength Fortifications have the fort type displayed in the Terrain Info Box in ALL CAPS (example: TRENCH). Abandoned forts, or forts occupied by the opposite side are listed in the Terrain Info Box in upper and lower case (example Trench). Improved Positions and Trenches that have been abandoned, can be restored to the existing full strength status by a unit successfully "Digging-In" again. Abandoned Bunkers and Pillboxes can never be restored to full strength once abandoned or captured. Improved Positions (IP) - These are the least protective of all the fortifications in the game but the fastest to be created. They benefit all units (men, guns, and vehicles) and represent hastily prepared breastworks and foxholes using material readily at hand such as mounds of dirt, shell holes, old vehicles and enhancing whatever the unit may find in that particular location. Part of their protection is derived simply from camouflaging the positions. Trenches - Trenches are the next step up from IP’s as Fortifications go. Like IP’s they benefit all units (men, gun, and vehicles) and offer the best protection that units can create during play. At this stage in a fortifications life cycle, the units are now digging downward much deeper than before and throwing up higher dirt embankments. Therefore the fortification begins to take on more defense benefits and rely less upon camouflaging. Bunkers - Bunkers are the next step up in Fortification development. Bunkers can be part of a scenario or may be created by Digging-In during a scenario from Trenches by non-Bridge Engineers. What Bunkers offer over Trenches is generally timber protection from Direct Fire and overhead protection from Indirect or Artillery Fire. As such, Bunkers only protect non-vehicular units and are treated as Hard Targets in terms of their defense. Pillboxes - Pillboxes are fortifications that cannot be created during game play. They also only benefit non-vehicular units and represent a much more permanent defense complex made of concrete and steel. Therefore units protected by these fortifications are considered Hard Targets. Note: Fortifications that are not currently spotted by a friendly unit do not appear on the map when Fog-of-War is in effect. This applies even if the fortifications were originally occupied by your units. The purpose behind this rule is to prevent you from getting intelligence about the enemy by being able to see abandoned fortifications restored by the opposing side. When an indirect fire unit fires on a Hard Target, either hard vehicles or units deployed in a hard fortification, then the disruption effect is twice that of normal. For hard vehicles, this is the effect of causing them to "button up" and thus have reduced effectiveness. For hard fortifications, this is a result of the "pounding" that results on the fortifications and the disruptive effect this has on the occupants. When an indirect fire unit fires at a Headquarters unit, then the disruption effect is twice of normal. This is the effect of the indirect fire breaking telephone lines, radio antennas, and other means of communication. When towed anti-tank guns or towed heavy AA guns fire on a hard vehicle, the disruption effect is twice that of normal. This effect is based on the fact that they guns are deployed in fixed locations and as a result have increased accuracy as opposed to mobile guns which are firing on the move. This probability applies up to ranges of 10 hexes. The Parameter Data Value for Counterbattery is used per side to modify this default probability. In general, unit facing does not have an effect on the game. However, certain units may be specified in the Scenario Editor as having a specific Facing. When this is done, the firing of the unit is restricted to the direction the unit is facing in plus the two adjacent directions. For example, a unit having a facing of Up Right can fire at targets that are in the direction Up Right from the firing unit, plus targets in the Up direction and Down Right direction. In addition, a unit with a specific Facing will only have a Zone of Control consisting of the hex it is facing plus the two adjacent hexes and will only have an Assault value when assaulted through a facing hexside. Guided Missile Weapons are not subject to range effectiveness and fire up to their maximum range at normal effectiveness. Depending on the scenario, a Guided Missile Experience modifier may apply. The purpose of Guided Missile Experience is to reflect how proper training relative to GM warfare was not in existence in the earlier years and some armies took heavier losses from GM attacks than they did after gaining experience. Depending on the scenario, a particular side may have a non-zero Guided Missile Experience value. When this occurs, enemy GM attacks against them will be tripled. For each GM attack by the enemy, the GM Experience value is decreased by 1 until it becomes 0. Once it becomes 0, then the GM Experience effect no longer applies to that side. Certain units may be classified as capable of firing Chemical and Tactical Nuclear Weapons. These units are labeled in the alternative unit display using the words WMD or IF/WMD. The side the unit is on must have a nonzero Persistent Chemical, Non-Persistent Chemical, or Tactical Nuclear Weapon ammunition value. If this is the case, then it is reported at the beginning of the turn in the Command Dialog. The Use Alt Fire option of the main menu must be enabled. When these conditions are met and a unit capable of firing Chemical or Tactical Nuclear Weapons fires, then the Alternate Fire Dialog is displayed so that you can specify a normal or WMD attack. A Chemical or Tactical Nuclear Weapon attack against a hex leaves a marker in the hex. In the case of Persistent Chemical attacks, the marker stays in the hex for the duration of the game (except that Chemical markers can be superseded by Radiation markers). All units in the hex when the firing occurs and all units that subsequently enter the hex are subject to WMD. Persistent Chemical markers are green. Non-Persistent Chemical markers are red. Radiation markers resulting from a tactical nuclear attack show the radiation symbol. The resolution of a WMD attack involves several factors. Disruption automatically occurs against units under a WMD attack. The loss suffered by the unit depends on the size of the unit and its quality. In general, a unit with strength S in men equivalent value, suffers a Persistent Chemical Attack of fire value 2 * S * Q where Q is a quality factor that depends on the quality of the target unit. For target units of Quality A or B, the quality factor is 1, for target units of Quality C or D, the quality factor is 2, and for target units of Quality E or F, the quality factor is 3. Non-Persistent Chemical attacks are four times as lethal as Persistent Chemical attacks. Initial Tactical Nuclear attacks are based on the lethality of Persistent Chemical attacks times the Nuke Factor Parameter Data value for the firing side when fired and then four times as lethal for units that move into a Radiation hex after that. Chemical and Radiation markers cannot be removed by the player during a scenario. Non-Persistent Chemical markers are removed with a probability of 50% at the beginning of each player turn. Radiation markers are removed with a probability of ½ of 1% at the beginning of each player turn. Note: depending on the scenario, one side or the other may have a WMD allocation, but be prevented from using WMD first. If this is the case, then after the other side uses WMD, the allocation if any will be made known to the player and that side will be allowed to use WMD from that point on. Using the scenario editor, it is possible in a scenario for specific units to be flagged as having Chemical or Nuclear weapons. In the playing of the scenario, the player has the option of using those weapons one time for any one unit. These weapons may be used in any adjacent hex. To use these weapons, select the unit and then use the Use WMD option of the Command Menu. If the side for that unit is prevented from using the weapon carried by the unit in the scenario being played (see WMD allocation above), then that unit cannot use that weapon until the side is free to use that allocation. However the use of individual chemical or nuclear weapons does not take away from the allocation for that side of that weapon. When a scenario has a non-zero Artillery Mine ammo limit, then it is possible for indirect fire units to fire artillery mines. This results in a strength 1 minefield in the target hex. They have no effect if a minefield already exists in the target hex except that they can be used to remove the Penetrated status of a minefield. Artillery Mines have no effect against hexes containing Fortifications (Improved Positions, Trenches, Bunkers, and Pillboxes). The Use Alt Fire option of the main menu must be enabled so that the Alternate Fire Dialog is displayed allowing the choice of firing artillery mines. When a non-TIS unit fires on a unit with TIS, the fire value is halved. This represents the ability of the unit with TIS to stand off and stay out of the LOS of non-TIS units. When a unit with TIS fires at a non-TIS unit, the fire value is doubled. This represents the ability for the unit with TIS to fire on the non-TIS unit without being detected by the non-TIS unit. Units that have TIS are identified if you right-click on their unit picture with either the words "Thermal IS" or "TIS". A unit uses its AA fire value when firing at a flying helicopter unit. A unit with no AA attack value or an AA range of 0 cannot fire at a flying helicopter. To avoid a tactic where players move units into a single hex, fire twice, and then move out, over and over with different units, there is a limitation on the total number of firing that can originate from a single hex. The Hex Fire Limitation rule says that for a stacking limit of X, at most 3 * X firings, measured in men equivalent strength, can originate from any one hex in a single turn. For example, if the stacking limit was 1600. Then one stack of 1600 men could fire twice from a single hex, but if they were to leave and another stack of 1600 men enters the hex in that same turn, they could only fire once before the Hex Fire Limitation applied. Siege Guns are only allowed to fire once per turn. They cannot use Opportunity Fire or fire during the Defensive Fire Phase. Siege Guns when fired against Pillboxes have their nominal fire value multiplied by 50. Siege Guns require their full movement allowance to change into or out of Travel Mode and must always be in Travel Mode to move. When the optional Setting Up rule is in effect, Siege Guns have half the normal probability of setting up per turn.